Even after completing the review of Angela Liddon's cookbook, The Oh She Glows Cookbook , I couldn't stop trying her recipes. The pictures make every recipe oh-so-tempting. 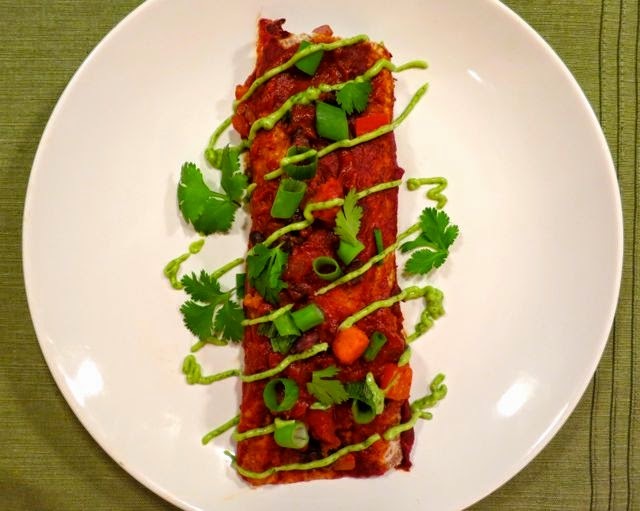 Enchiladas are one of my favorite things in this world so I decided to make her Sweet Potato and Black Bean Enchiladas with Avocado-Cilantro Cream Sauce. It did not disappoint. This is the perfect dinner party recipe because it aims to please. 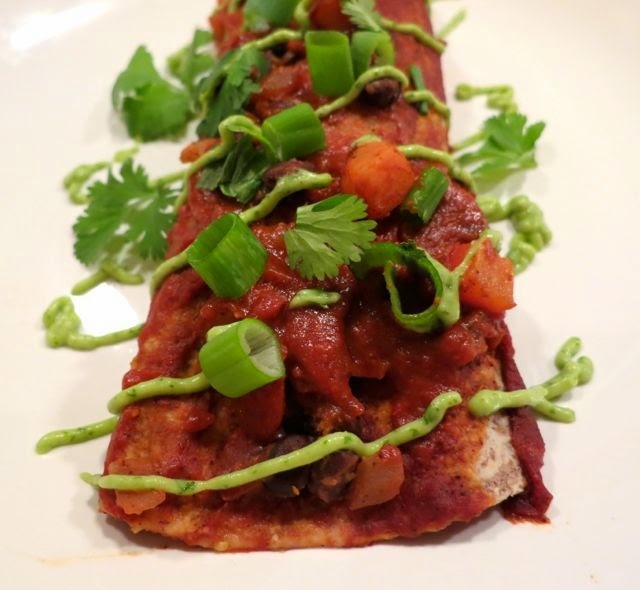 A delicious mixture of sweet potatoes, black beans, red pepper, and spinach are mixed with enchilada sauce and stuffed into a sprouted grain tortilla then topped with cilantro, scallions, and avocado-cilantro cream sauce. Yes, it is just as good as it sounds. Preheat the oven to 350-degrees. Lightly grease a large rectangular baking dish. 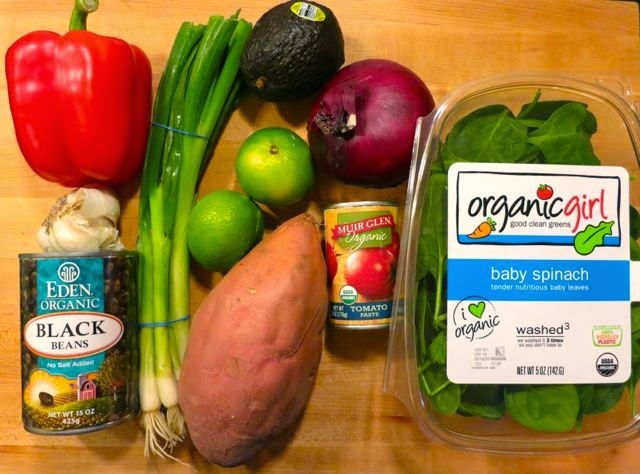 Make the Enchiladas: Place the sweet potato in a medium saucepan and add enough water to cover. Bring the water to a boil, then reduce the heat to medium high and simmer for 5 to 7 minutes, or until fork-tender. Drain and set aside. In a large skillet, heat the oil over medium heat. Add the onion and garlic and saute for about 5 minutes, until the onion is translucent. Season with sea salt and black pepper. 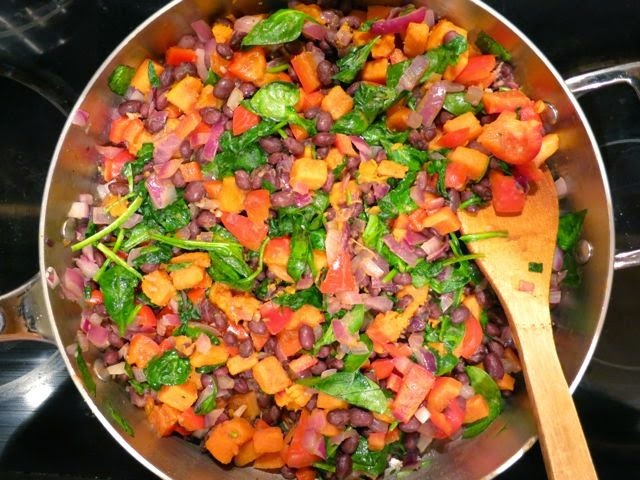 Add the bell pepper, cooked sweet potato, black beans, and spinach. Raise the heat to medium-high and cook for a few minutes more, or until the spinach is wilted. Remove the skillet from the heat and stir in 1/4 cup of the enchilada sauce, lime juice, chili powder, cumin, and salt. Spread 1 cup of enchilada sauce evenly over the bottom of the prepared baking dish. Scoop 3/4 cup of the sweet potato filling onto each tortilla. Roll up the tortillas and place them seam side down in the baking dish. Spread the remaining enchilada sauce over the tortillas. If you have leftover filling, spoon it on top of the tortillas as well. Meanwhile, make the Avocado-Cilantro Cream Sauce: In a food processor, process the cilantro until minced. Add the avocado, lime juice, sea salt, garlic powder, and 3 Tbsp water and process until creamy, stopping to scrape down the bowl as needed. When the enchiladas are ready to serve, plate them individually and drizzle or spread some of the Avocado-Cilantro Cream Sauce on top of each. Garnish with cilantro and scallions, if desired.